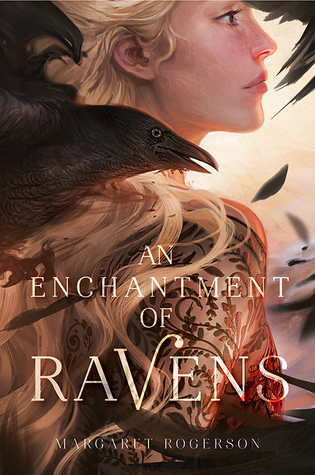 ‘An Enchantment of Ravens’ by Margaret Rogerson was charming. Synopsis: Isobel is a prodigy portrait artist with a dangerous set of clients: the sinister fair folk, immortal creatures who cannot bake bread, weave cloth, or put a pen to paper without crumbling to dust. But when she receives her first royal patron—Rook, the autumn prince—she makes a terrible mistake. She paints mortal sorrow in his eyes—a weakness that could cost him his life. Furious and devastated, Rook spirits her away to the autumn lands to stand trial for her crime. Waylaid by the Wild Hunt’s ghostly hounds, the tainted influence of the Alder King, and hideous monsters risen from barrow mounds, Isobel and Rook depend on one another for survival. Their alliance blossoms into trust, then love—and that love violates the fair folks’ ruthless laws. Now both of their lives are forfeit, unless Isobel can use her skill as an artist to fight the fairy courts. There is a dreamlike quality to this book and it was heady. The pace of the story seemed relatively constant but there would be times where in the space of a paragraph, the characters appear in a different place and time. This wouldn’t be too much of an issue had they not travelled extensively and in considerable detail. I couldn’t tell if it was a creative choice for the author or if it was something that was overlooked. Either way, it added to that dream-esque feel and this was heightened by the descriptions of some of the creatures we encounter and the Fair Ones. I would love my own Rook. Everyone loves a dark, broody male but I found he was much more than that. He’s arrogant, vain and use to getting his own way (because he’s a prince, you know) but with Isobel, he became his true self. Sure he was still all those things I mentioned, but it was toned down, and he had a vulnerability about him when he was with her. He’s also hilarious and the tea pot scene remains my favourite. Isobel was a character I had a harder time connecting to. She’s shrewd and quite practical and I enjoyed seeing her feelings for Rook develop despite her reluctance. I bought this book over a year ago and so barely remember what it was about. This was a quick read for me and I enjoyed it a lot more than I expected to. This portrayal of Faeries was different to what I had read before in regards to their glamour and it was an interesting spin – and creepy. All in all, a great read and the romance wasn’t terrible!